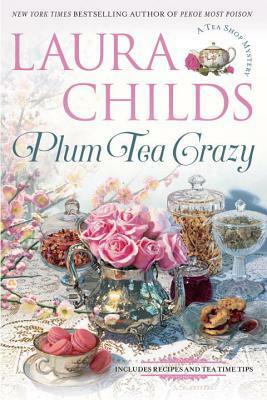 Plum Tea Crazy is the 19th book of the Tea Shop mystery series by Laura Childs. In this book, we visit Charleston along with the Indigo Tea Shop. Theodosia Browning, the owner of the shop, along with Drayton, her tea connoisseur and Haley, the one who makes the delicious fare, keep the tea shop humming along. It's always busy. Theo, Drayton and others are watching the Parade of Ships from a friend's widow walk. One of the watchers falls to his death and Theo finds herself in the middle of a murder investigation once again. I thoroughly enjoyed this book. Laura Childs always brings me right into the story. I can see Charleston. I feel like I'm visiting the tea shop, enjoying a wonderful cup of tea that Drayton has brewed and having a wonderful lunch made by Haley. Theo, Drayton and Haley are wonderful characters that bring their own humor and personalities to the story. They feel like family and I'm always excited to see what adventures they bring to the story. The mystery in this book is outstanding. I could not put it down. There were twists and turns kept me guessing until the last page. Even when I thought I had it figured out, there would be a new clue to point me in a different direction. I would recommend this book to any reader who loves wonderful characters who interact so well that they seem like a family. I would also recommend this book to any cozy reader who loves twists and turns that will hold you captive until the end. Laura Childs is one of my favorite authors. I have always found her books to be so much fun. As well as the Tea Shop mystery series, she has two others. The Cackleberry Club series and the Scrapbooking series is great too. Check them out.